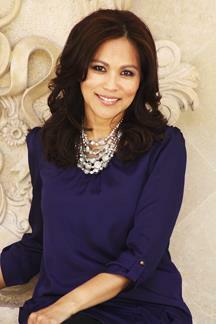 Update: The other day, I was given the sad news that Ros Guerrero lost her battle with cancer. My heart goes out to her and her family. She was such a bright and kind soul — I will miss her deeply. Ros Guerrero was a busy mom raising her special needs daughter when she was looking for a way to spruce up her daughter's tired, plain eyeglasses and make it a fun accessory her daughter could get excited about. Read on to see how she was able to take this idea and turn it into a thriving at-home business. Tell us a little bit about Ficklets and how you got started. Ficklets is a product I invented, inspired by my 15-year-old special needs daughter Gem, who has worn glasses since she was 6 years old. 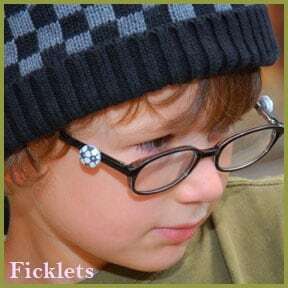 Ficklets is a patented interchangeable charm hugger for eyeglasses, designed to adorn eyeglass frames with a fun, fresh twist to help children feel more comfortable in their glasses. What did you do before launching Ficklets? Before becoming a mom, I worked in both retail and wholesale, selling European luxury goods for a total of 10 years; the latter part of this tenure as a brand manager. This experience would later help me with Ficklets as it gave me the fundamentals of a product based business in terms of – operation, sales, inventory management, mark-ups, PO’s, etc. I then became a full-time mom when I had Gem. As she got older, I started several business ventures – real estate investing, co-owned a window treatment design company, and a nail salon. By the way, I’m a licensed nail tech in Arizona and have a thing about making women’s toes pretty. I love seeing the transformation and how it puts a smile on a client’s face. It’s amazing how that little bit of pretty gives a woman that extra pep in her walk. You recently heard back from a major U.S. Optical Distributor who exclusively wants to distribute Ficklets — tell us about this and what it means for Ficklets. This is a huge development for us. We’re beyond excited to be partnering with a strong, reputable company who has 30 plus years in the optical accessory industry. The brand exposure and growth will be tremendous for Ficklets with their ongoing – targeted marketing campaigns to their large customer base and network. Incidentally, the distributor heard about Ficklets from an industry veteran/blogger at a trade show Ficklets didn’t exhibit, attend or advertise. This is the second time someone has heard about Ficklets at a trade show which we were not involved in. So, we’re thrilled the buzz about Ficklets is spreading. I work 60-65 hours a week now with all the new development with most of those hours in-office. Initial working capital from personal savings. We’re still a young company and have barely scratched the surface, but considering where we are today, I would rate us a 7 with big growth potential. One word–Husband. Without my husband to pick-up where I leave off, I couldn’t take on the business. He’s been the one key reason why I’m able to build Ficklets without our home, marriage, and raising a mentally handicapped child falling apart. We work as partners and remove the ego in order to get it done. Our daughter deserves it. Working capital for product expansion and brand exposure – PR/marketing. What are your favorite websites or blogs? Take consistent ACTION … and don’t over think it! Thanks, Ros for sharing your story! I have been surfing online greater than 3 hours as of late, but I never found any interesting article like yours. It’s pretty worth sufficient for me. Personally, if all web owners and bloggers made good content as you did, the web will likely be a lot more useful than ever before. You’re welcome Ros! It’s been such a pleasure getting to know you and I love Ficklets, truly a product with heart! Thank you again Holly for inviting me to be a part of your blog community that champions mom entrepreneurs and family values. You & your readers are inspiring women.